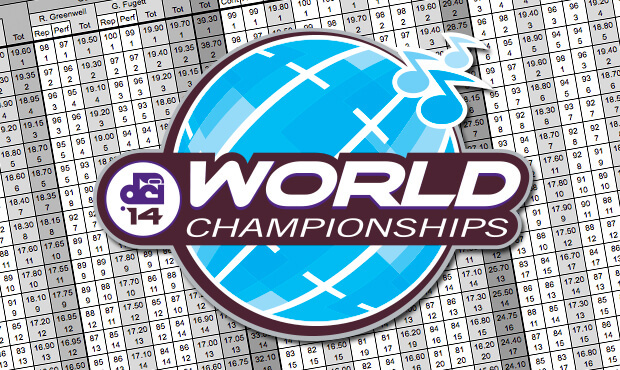 Here is a very brief look at the scores awarded to the 37 corps competing at the 2014 Drum Corps International World Championship Prelims, Thursday, Aug. 7. The top 25 corps will advance to Friday's Semifinals competition. Blue Devils (1st, 98.550) took 2nd in Percussion (0.10 under SCV) and 1st in the other seven captions, capturing a perfect score in Visual Analysis. The Cadets (2nd, 96.925) were 2nd in all captions except the three Music captions, placing 3rd in Music Analysis and 4th in Brass and Percussion. Bluecoats (3rd, 95.800) was 3rd in General Effect 2, Color Guard, Brass and Percussion, and 4th in GE 1, Visual Proficiency, Visual Analysis and Music Analysis. Santa Clara Vanguard (4th, 95.450) was 1st in Percussion, 3rd in GE 1 and Visual Analysis, 4th in GE 2 and Color Guard and 5th in Visual Proficiency, Brass and Music Analysis. Carolina Crown (5th, 94.750) was 2nd in Brass (by 0.10 under BD), 2nd in Music Analysis (by 0.20 under BD), 3rd in Visual Proficiency, 4th in GE 2, 5th in GE 1 and Visual Analysis and 6th in Color Guard and Percussion. The Cavaliers (6th, 93.600) took 5th in GE 1, Color Guard and Percussion and 6th in the remaining five captions. Blue Knights (7th, 91.650) placed 6th in Percussion, 7th in GE 1, Visual Analysis, Color Guard and Musical Analysis, 8th in GE 2 and Brass, and 9th in Visual Proficiency. Phantom Regiment (8th, 91.025) was 7th in GE 2, Visual Proficiency and Brass, 8th in GE 1, Visual Analysis and Music Analysis, and 10th in Color Guard and Percussion. Blue Stars (9th, 89.375) was 8th in Color Guard, 9th in GE 2, Visual Analysis, Music Analysis and Percussion, 10th in GE 1 and Visual Proficiency, and 11th in Brass. Boston Crusaders (10th, 89.125) took 8th in Visual Proficiency and Percussion, 9th in GE 2 and Color Guard, 10th in Visual Analysis, Brass and Music Analysis, and 11th in GE 1. Madison Scouts (11th, 88.425) placed 9th in GE 1 and Brass, 12th in Color Guard and 11th in the remaining five captions. Crossmen (12th, 86.250) was 11th in Color Guard, 15th in Visual Analysis, and 12th in the remaining six captions. Colts (13th, 84.725) was 12th in GE 1, and Visual Analysis, 13th in GE 2 and Visual Proficiency, 14th in Color Guard, 15th in Music Analysis, and 17th in Brass and Percussion. Troopers (14th, 84.600) was 13th in GE 2, Visual Analysis, Color Guard and Brass, 14th in GE 1, Visual Proficiency and Brass, and 15th in Percussion. Spirit of Atlanta (15th, 82.300) was 13th in Brass and Percussion, 15th in GE 2, Visual Proficiency and Color Guard, 17th in GE 1 and Music Analysis, and 19th in Visual Analysis. The Academy (16th, 81.875) placed 14th in Music Analysis, 15th in GE 1 and Brass, 16th in Visual Analysis and Percussion, 17th in GE 2, 18th in Visual Proficiency, and 20th in Color Guard. Oregon Crusaders (17th, 81.050) was 13th in Percussion, 16th in GE 1, Brass and Music Analysis, 17th in Visual Proficiency, 18th in GE 1 and Visual Analysis, and 23rd in Color Guard. Blue Devils B (18th, 80.800) was 14th in Visual Analysis, 16th in GE 2 and Visual Proficiency, 18th in GE 1 and Color Guard, 19th in Brass and Percussion, and 20th in Music Analysis. BDB was the highest placing and scoring Open Class corps at the Prelims. Pacific Crest (19th, 79.375) was 17th in Color Guard, 18th in all three Music captions, 20th in GE 1, GE 2 and Visual Proficiency, and 21st in Visual Proficiency. Vanguard Cadets (20th, 79.300) took 17th in Visual Analysis, 18th in GE 2, 19th in GE 1, Visual Proficiency and Color Guard, 20th in Percussion, and 21st in Brass and Music Analysis. Mandarins (21st, 77.750) placed 19th in Music Analysis, 20th in GE 1, Brass and Percussion, 21st in GE 2, 22nd in Visual Proficiency and Visual Analysis, and 24th in Color Guard. Jersey Surf (22nd, 75.550) was 24th in Visual Proficiency and Brass, 25th in Visual Analysis, 26th in Color Guard, and 22nd in the remaining four captions. Genesis (23rd, 75.175) was 21st in Visual Proficiency and Color Guard, 24th in Visual Proficiency, 26th in Brass, and 23rd in the remaining four captions. Spartans (24th, 74.425) was 15th in Color Guard, 20th in Visual Analysis, 24th in GE 2 and Percussion, 25th in GE 1, Visual Proficiency and Brass, and 27th in Music Analysis. 7th Regiment (25th, 72.350) will make its first appearance in the Semifinals by placing 23rd in Visual Proficiency and Brass, 25th in Music Analysis and Percussion, 26th in GE 2, 27th in Color Guard, 28th in Visual Analysis, and 29th in GE 1. The following corps will not be advancing to Friday night's Semifinals. Cascades (26th, 72.250) was 22nd in Brass, 30th in Color Guard, and between 24th and 27th in everything else. Music City (27th, 71.575) was 24th through 30th in all captions. Gold (28th, 71.250) was 22nd in Color Guard, 23rd in Visual Analysis, and 27th through 30th in the remaining six captions. Legends (29th, 71.000) was 30th in Percussion and 26th through 29th in everything else. Pioneer (30th, 68.850) was 26th in Percussion and 29th through 32nd in the remaining seven captions. Raiders (31st, 66.250) was 28th in Color Guard and 30th or 31st in all other captions. Colt Cadets (32nd, 63.150) was 31st through 33rd in all captions. Coastal Surge (33rd, 60.625) was 32nd through 35th in all captions. Les Stentors (34th, 57.425) placed 34th or 35th in all captions. Racine Scouts (35th, 55.600) was 33rd through 35th in all captions. Blue Saints (36th, 51.250) was 37th in Color Guard and 36th in all other captions. Patria (37th, 46.375) was 36th in Color Guard and 37th in all other captions.